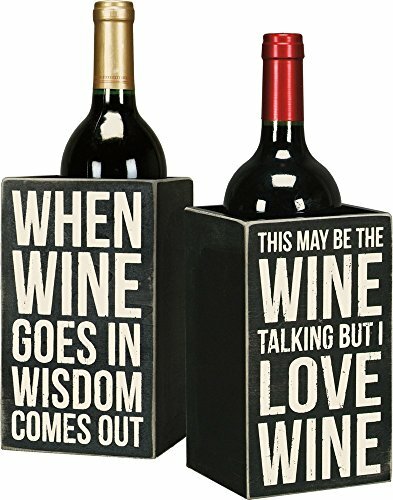 A wooden box sign style wine holder featuring distressed "When Wine Goes In Wisdom Comes Out / This May Be The Wine Talking But I Love Wine" side panel sentiments with hollow interior for holding a bottle of wine. CAREFULLY BUY ONLY FROM AMAZON or trusted Amazon partners to guarantee authentic Primitives By Kathy gifts and decor with premium quality printing, stitching, and fabrics. In 1997, Kathy made her first "primitive candle box" by hand, taking care into each detail from the sanded edges to the type of ribbon tied on the wire handles, each was a work of passion. As Primitives by Kathy grows, the company works to give back, starting with an initial relationship with Goodwill Services and expanding into several more charitable causes held both by the company and those the company supports on behalf of their employees. They are constantly inspired by the people, places and things around us. Kathy travels the world to pull inspiration first hand from cultures around the globe. Look for all of Primitives by Kathy for inspirational, fun, sarcastic, and heart-warming gifts and home decor. You'll want to have one for yourself and another for someone you care about.